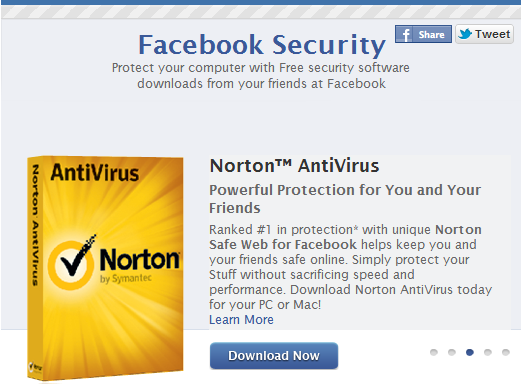 Facebook has launched Anti-Virus Marketplace , a new portal to protect the social network's users.Members are being encouraged to download anti-malware programs which they can use at no cost for six months. Facebook is strengthening its security controls in an attempt to protect its 900 million users from spam and malicious content.Facebook said Wednesday that it will work with Microsoft Corp. and with computer security firms Trend Micro Inc., Sophos, Symantec Corp. and Intel Corp.'s McAfee to provide safeguards on Facebook. "The Antivirus Marketplace was developed with industry partners to enhance protection for people on Facebook," Facebook wrote in a blog post. "This program will help us provide even better protections to those using Facebook, no matter where they are on the web." Facebook's security push comes as social networks become an increasingly popular target for spammers and hackers, as Sophos suggests in a report on the top countries responsible for spam. Facebook also plans to incorporate the various security firms' URL blacklists into its own anti-spam efforts. The company says the current blacklist limits spam to just four percent of all content posted on Facebook.